Q. CAN YOU EXPLAIN A LITTLE BIT MORE ABOUT THE CURRICULUM YOU FOLLOW? Play-based, Integrated Learning, Bilingual, Holistic, Child-directed. Learning through Inquiry encourages children to ask questions and think, and this contrasts with an academic learning by rote approach. 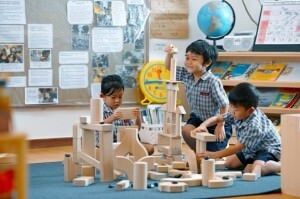 At E-Bridge Pre-school we work with an integrated inquiry based curriculum that is inspired by the Reggio Emilia Approach. Learning through Inquiry encourages children to observe, explore, ask questions, notice as well as understand the world around them. This we believe nurtures happy, confident, and secure individuals with an inquisitive mind. Our comprehensive curriculum is integrated across all the learning areas; literacy, mathematics, science, creative arts, and also physical and socio-emotional development. Our programme is suited for both International and National schools, including Chinese vernacular schools. We have English and Mandarin as primary languages, and introduce Bahasa Malaysia in Kindergarten 1 & 2 (5-6 years old). Our curriculum complies with, and in some aspects exceeds, the National Standard Pre-school Curriculum (KSPK) by the Ministry of Education. Q. ARE THE CENTRES FULLY AIR-CONDITIONED? Air-conditioning is provided in all the classes, but it is only used when required. By default free circulating air is more healthy for the children. Q. IS THERE INFANT CARE PROVIDED? Infant care is only available at E-Bridge Bayan Baru (Arena Curve). Q. WHAT ARE THE OPERATING HOURS? Closed on Sat, Sun, and Public Holidays. Exact closure days are specified in our school calendar available at the center. Fees differ by center, but generally to enrol there is a non-refundable one-time Registration Fee and a monthly school fee. There is also a refundable security deposit that is equivalent to 1 month fees. Please click here for the breakdown of fees by center. Q. ARE THERE ANY ADDITIONAL COSTS OR FEES? The monthly school fee includes meals and supplies, and we do not charge additional Book or Material fees. All students are required to take personal accident insurance whilst at the school. Q. HOW DO I ENROL MY CHILD? If a spot is available for your child, it will be reserved for your child after you make the initial payment. The initial payment amount includes the Registration Fee + 1 month deposit + first month fees. We prefer bank transfer, so do send us payment proof after transfer is done. The completed Application Form, Terms & Conditions, and required documents must be submitted before your child’s first day of school. Q. WHEN CAN I START MY CHILD AFTER ENROLMENT? While we follow Malaysia’s national school term calendar for the purposes of curriculum planning, but you can choose to start your child any time in the year, including school holidays. The first payment is for a full month fee, but if your child does not start on the first day of the month, we will make an adjustment in your second-month fees on a pro-rata basis to compensate. Q. ARE YOU CLOSED DURING SCHOOL HOLIDAYS? We remain open during school holidays. Q. WILL CHILDREN BE SHOWERED? Yes, showering will be provided. We generally do not send home homework where the child is expected to complete an activity or worksheet then return it to the class teacher. For children in full-time preschool programs, we believe that after a long day at school what children need most is time relaxing and interacting with mum and dad. The preschool years are an important time for bonding with parents and this time together should be respected. For the Kindergarten classes (5-6 years old), the teacher may assign a nominal amount of homework, for example, home study for dictation, just so the child gets used to the idea of Homework and can adjust in primary school. Q. HOW DOES THE SCHOOL COMMUNICATE WITH PARENTS? We primarily use an online platform to communicate with parents. This includes attendance (check-in, check-out records), portfolio (photos from class are uploaded here and are tagged to specific children), weekly updates, announcements and bulletins (newsletters, notices etc.). Q. WITH YOUR PLAY-BASED APPROACH, WILL CHILDREN BE PREPARED FOR NATIONAL PRIMARY SCHOOL? A large proportion of our children go on to local primary schools, where there are high expectations for literacy and numeracy. We incorporate the learning and interest for literacy and numeracy in the inquiry projects that our children engage in. We ensure that children explore linguistic and mathematical concepts in a meaningful context. 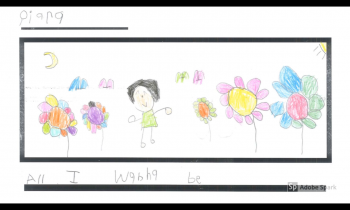 The learning goals that we set for our Kindergarten level children meet, and exceed, the requirements of the National Standard Pre-school Curriculum (KSPK). Education is as much about acquiring the disposition to learn as it is about tangible learning outcomes. We believe we support the development of strong, confident individuals, who are equipped with the skills, knowledge and dispositions to make sense of the world around them. This natural curiosity to learn that involves language, social, numeric and creative skills equips them with a strong foundation that sees them through the later years of their education as successful learners and contributors to the learning process. Q. MY CHILD IS NOT YET TOILET TRAINED, IS THAT A PROBLEM? We do not require children to be toilet trained, and we will help with toilet training where required. Q: HOW DO YOU PREVENT OUTBREAKS OF CONTAGIOUS DISEASES? We do a health check on drop off, and we do further health checks during the day. We sanitise the resources twice a week, but often the primary mode of transmission for most contagious diseases (especially Hand Food Mouth Disease) is from direct contact, and so the best defense is early detection and isolation. Children who are ill are isolated immediately whilst waiting to be picked up by parents. If there is an outbreak we also minimise contact between different classes and limit the use of common areas. Parents play a crucial role in preventing the spread of the infection. Checks in the morning for fever, mouth ulcers, blisters on mouth, arms, feet and buttocks should be done before coming to school to ensure that the child who is affected gets the proper care and medical attention and also help prevent the spread of the infection to others in the community. Reinforcing good hygiene practice at home also goes a long way in minimising the spread. The child should be sent to school only when the doctor certifies that it is ok to do so. It is also recommended that the child has no social contact outside of school during the contagious period.